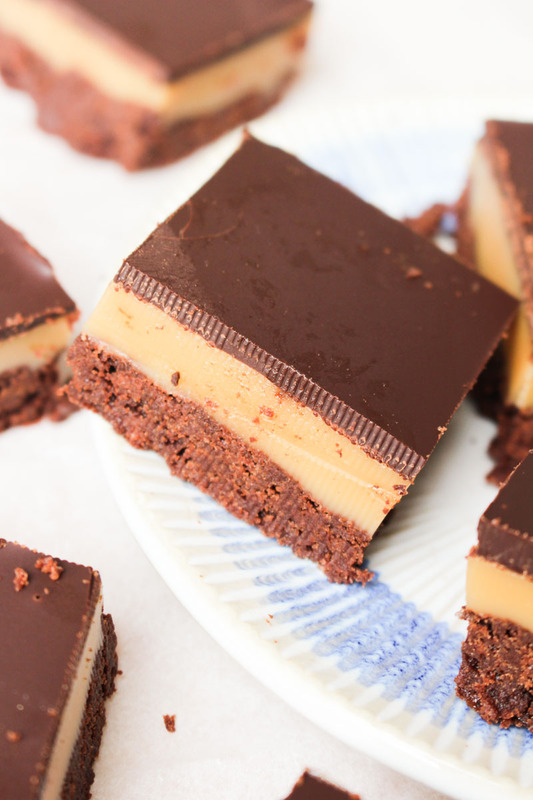 Millionaire’s shortbread is one of my all-time favourites. How could I possibly make it better? As always, the answer turned out to be more chocolate. This is a triple whammy of perfection. On the bottom, you’ve got a soft and crumbly chocolate shortbread base. Incredibly simple and quick to make, with plenty of cocoa to compliment the sweetness of the caramel above. You will be pleased to hear that the caramel itself is made the cheat way, with condensed milk. You will still need to be careful not to overcook it, as I did in attempt #1. If it gets too hot, then it will cool way too hard like a tablet of toffee. No one wants millionaire’s shortbread that will result in an emergency dental trip. To get the caramel to the perfect consistency, you want to cook it until it gets to a gloopy point. If you run your spatula across the bottom of the pan, you want to be able to see the pan for a few seconds, before the caramel slowly runs back together. I really should have made a video. The chocolate topping is much easier to get right – just melt in the microwave or over a pan of boiling water. Stir the chocolate every 20 seconds or so if using the microwave to avoid that horrible burnt taste. There’s no way back from that. I left my millionaire’s shortbread to set in the fridge, but this makes cutting into squares much harder. Lots of cracked chocolate ensued. To avoid this, make sure the slab of shortbread comes back up to room temperature before slicing into squares. But even cracked these guys still taste like heaven. 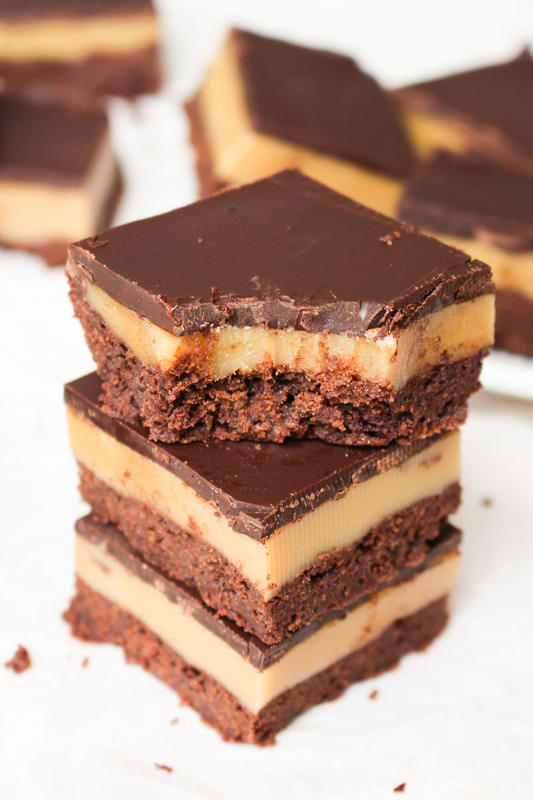 Caramel and chocolate, in a tray bake. What more could anyone want? Preheat the oven to 180ºC / 355ºF (160ºC fan) and line an 8inch square brownie tin with grease-proof paper or aluminium foil. There is no need to grease. Beat the butter and sugar together using a stand or hand mixer. Add the vanilla extract, flour, cocoa and salt, and fold together gently until it forms a chocolate dough. Press the dough into the tin, making sure there is an even layer of shortbread across the bottom and that it has been pressed all the way into the corners. Prick the bottom with a fork a few times, and then pop into the oven to bake for 22-24 minutes. It will feel very soft after this time, but it will harden up once cooled. Leave to cool in the tin on a wire rack. Place the butter, sugar, syrup, condensed milk, and salt into a large saucepan, and heat on medium until the butter and sugar have melted, stirring constantly. Keep stirring whilst the caramel mixture comes to a boil. The caramel will need to boil for 2-3 minutes, until it reaches a thickened and gloopy consistency, and has changed colour to a light golden brown. Do not boil for longer than 4 minutes, or the caramel will be too hard. Make sure to stir throughout the whole process, or the caramel may burn. Once the caramel is thick enough, pour over the shortbread base and leave to cool in the fridge for a couple of hours. Break the chocolate into pieces, and melt in the microwave or over a saucepan of boiling water. If using the microwave, make sure to stir every 20 seconds to avoid burning the chocolate. Once fully melted, pour the chocolate over the set caramel, and tilt the pan to make sure it reaches all the corners. Put the millionaire's shortbread back into the fridge to set. Once the chocolate has set, remove from the fridge to warm back up to room temperature before slicing into 16 squares, to avoid the chocolate cracking on top. The shortbread will stay good for 3-4 days if stored in an airtight container in a cool place. If you live somewhere warm, it may be worth storing in the fridge to avoid melting. Learn from my mistakes - don't leave in the sun. The squares can be frozen for 2-3 months.